General & Excellent information on essential oils. There is an abundant supply of blood vessels in the skin, when a nutritious carrier oil is used with an essential oil on the skin, the skin absorbs the essential oil much better, and then the capillaries absorb it into the blood stream, and then onto the cells of the body. Carrier oils play an important part of aroma therapy. When considering an illness you could start with looking at some properties of some carrier oils. Olive Oil contains vitamins, minerals, and protein and is very nourishing and soothing to the skin. Olive Oil contains polyphenol compounds that act as antioxidants to help prevent and repair damage to the skin done by accidental sun exposure. Sesame seed is an antifungal. The vitamin E in sesame oil make it a very good emollient and moisturizer, which, if used regularly, keeps your skin moisturized, healthy, hydrated and nourished. Aloe Vera has all the anti properties, anti-inflammatory, anti-viral, anti-fungal, anti-septic, anti-bacterial etc. Apricot a light nourishing oil that is quickly absorbed. Rich in essential fatty acids like oleic and linoleic acid, apricot kernel oil is high in vitamin A. Since it easily penetrates the skin, it is good oil for prematurely aged, dry or irritated skin. The excellent softening and moisturizing properties is great for face, hands and hair. Vitamins A & C are good for mature dry or sensitive skin. The apricot kernel oil helps skin retain elasticity, clarity, and suppleness. Crushed Apricot Kernels are commonly used as a facial mask to soften the skin. In addition, Apricot Kernel Oil is used as an antitussive, anti-asthmatic and to treat tumors in traditional Chinese medicine. It helps to calm the inflammation / irritation of eczema and dermatitis. When combined with an equal amount of St. John's Wort Oil, it is acts as anti-inflammatory and has a cooling effect. Almond oil does not go rancid quickly and is nourishing. Good for prematurely aged skin. It is further a great moisturizer, suitable for all skin types, helps relieve irritation, inflammation and itching, and is greatly lubricating. Evening Primrose growth of cell tissues. Evening primrose oil have also been studied for treating acne, eczema, psoriasis, and other skin conditions. When used as a topical application on the skin, evening primrose oil has moisturizing and softening effects. Grapeseed antioxidant. Using the grapeseed oil in skin care products, helps to tone and tighten the skin. Grapeseed oil contains a high amount of linoleic acid, which is a fatty acid essential for the health of the skin and cell membranes, and is the reason it makes such a wonderful moisturizer, as it really nourishes your skin helping to keep it smooth and subtle. Grapeseed oil contains polyphenols, which are antioxidants. These polyphenols can help slow the process of aging, as well as having anti inflammatory and anti oxidant properties, which makes it great for helping clear up acne. Carrot Cell regenerating and rejuvenating, promotes healing and reduces scar tissue. Walnut stops itching, softening, anti-perspiring. Wheatgerm contains vitamin E, clears up complexion. When applied on the skin, it improves the circulation of blood and also helps to repair the skin cells destroyed by the scorching heat of sun. It keeps away the symptoms of dermatitis, thereby preventing the skin from being victimized by various kinds of problems. Thick in consistency, its independent use for massaging the body is not usually preferred. Since it has exceptional nourishing qualities, it is used in lesser quantities for preparing the carrier oil blend. Jojoba is actually a liquid wax which is very similar to human sebum It aids in the healing process. is a fungicide, and can be used for controlling mildew. Coconut oil/butter Among the most stable of all oils, coconut oil is slow to oxidize and thus resistant to rancidity. Coconut oil therefore is a safe solution for preventing dryness and flaking of skin. It also delays wrinkles, and sagging of skin which normally become prominent with age. Coconut oil also helps in treating various skin problems including psoriasis, dermatitis, eczema and other skin problems. Research shows that replacing other cooking oils with virgin coconut oil generally creates a more favorable HDL/LDL ratio. This oil has antiviral, antibacterial, antimicrobial, and antiprotozoal properties. Fractionated Coconut oil It is a distilled coconut oil which has one of the longest shelf lives. Shea Butter Natural sun block and natural skin moisturizer. Come from trees and therefore have the same properties as tree oils - antifungal, antiseptic, antiviral. They are cell rejuvenations and beneficial in the treatment of wrinkles for mature skins. Gum oils blend well with tree and citrus oils in the treatment of respiratory and skin infections or inflammation. Benzoin, Frankincense, Myrrh. This is a Quick Reference guide for Emotions. In Aromatherapy, use of essential oils, may assist, sometimes greatly, with particular emotional issues. Additionally, the proper use of essential oils may enhance your emotional outlook and provide support and help balance your emotions during the day. The use of essential oils for emotional well-being is what is often first thought of when someone thinks of the term "aromatherapy." "The inhalation of certain essential oils has been associated with the release of brain chemicals that stimulate various emotions. For example, lavender oil has the ability to evoke and increase the release of serotonin, thus producing a calming effect on the body." Bookmark this page. 15 ml = 1/2 oz. 60 ml. = 2 oz. 480 ml. = 16 oz. Blended Synergies: Belief, Release, Happy Memories, Forgiveness, Grounding. Blended Synergies: Happy Memories, Birth, Gathering Singles: Bergamot, Atlas Cedarwood, Roman Chamomile, Lemon, Orange, Grapefruit, Clary Sage, Frankincense, Geranium, Lavender, Sweet Marjoram, Melissa, Neroli, Patchouli, Petitgrain, Rose , Rosemary, Sandalwood, Vetiver, Ylang ylang. Now Available in 10 ml. roller ball bottles, with carrier oil added. An excellent source of Essential Oil and Aromatherapy Books, diffusors, and other aromatherapy supplies. 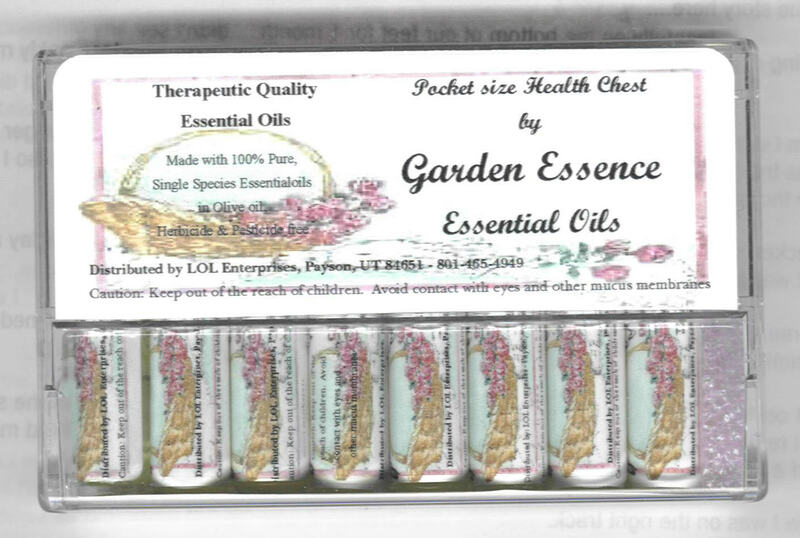 Contains carrier oil plus the following Essential Oils. GLC traces available upon request. Please inquire for details. We also provide countries of origin upon request. In a bath: Hopping into a warm bath at the end of a long day is one of life's most blissful moments. Add 5 to 8 drops of a blend of 3 oils before you climb into the bath. Agitate the water. Submerge your body to prepare yourself for the night ahead -- whether you're staying at home for a quiet and relaxing time, going to a party, or spending a romantic evening with your lover. You can also use essential oils in the morning to invigorate and refresh you for the day ahead. In a vaporizer: You can use a vaporizer at home or work to uplift or relax you. Vaporizers are used to fill the atmosphere with essential oils. Add 8 drops in total of your chosen combination of oils to the shallow dish filled with water at the top of the unit. You can choose oils to freshen the air, to assist with breathing, to aid concentration, or during a romantic interlude. Massage: Massage is already a popular and highly respected way of loving and healing the body. Combine this with the use of essential oils, and you have a recipe for divine relaxation. A massage oil is a combination of essential oils added to a base oil. You can use massage oils to promote circulation, stimulate the release of toxins from the body, or uplift the senses -- the list is endless. To every 10 milliliters (ml) of base oil, add 5 drops of essential oil (a 10:1 ratio). Body rub: You can begin every day with energy and vitality by indulging in a two-minute body rub after your shower. When the body is warm, it absorbs oil quickly. Choose 3 essential oils to add to your base oil, and blend in a small bowl. Smooth the oil over the entire body to stimulate circulation and protect you during the day to come. Inhalation: To help balance physical disorders and release emotions, you can inhale oils directly by adding 3 to 5 drops to a stainless steel or glass bowl, filled with boiling water. Add the drops of essential oils to the water (agitate to release the vapors). Place a towel over your head, and breathe deeply. For maximum benefit, keep your head over the bowl for 10 minutes. Remember to protect the sensitive eye area. Diffusor: Follow directions that come with diffusor. Do not run 24 hours a day. Only run approx. 15 to 30 minutes at a time. To make your compress, add 5 drops in total of your chosen 3 essential oils to a basin of hot or cold water. Fold a piece of gauze or a small towel, and soak it in the water. Squeeze out the excess water from the cloth, and apply it to the skin after the cloth has absorbed as much of the oil as possible from the surface of the water. Cotton balls or fabric made with natural fibers (no polyester or synthetic balls as they will melt with most oils) are great to put in front of fans or hang anywhere, especially where there is moving air. Also a good way to use Neem oil in pantries to get rid of pantry moths. (P.S.) I have been putting a dab of Neem oil on bottom of lids of containers that are subject to pantry flies such as flour, rice, popcorn, etc. - works great. Spritzer: Ideal for summer, a spritzer hydrates and re-energizes the skin. This is a bottle with a nozzle that sprays water in a mist-like form. You can also use a spritzer to apply essential oils to wounds or burns. Using 90 ml of water, add 5 drops of a combination of 3 essential oils to a spritzer bottle and shake often as oils and water do not readily mix..
Health - Apply to bottom of feet as that takes the oils immediately to the rest of the body. The cells on the bottom of the feet are some of the largest cells in the body. Also all the electrical meridians go through the feet. (Our bodies are electrical) Energy (acupressure) points are also great places to put oils. I also like over the tonsils on the throat or main lymphatic points. Put a drop or two on your palm, rub your hands together a few times and then cup your hands over your nose and breathe in the delightful fragrance. Great way to use the oils in public as the nose has large blood vessels that gather the oil and take it directly into the blood stream. To repel insects we use either Catnip essential oil or Pest Away and apply a drop on the back of the hands, top of feet, forehead or any other exposed area. It just takes a drop and should be used with a carrier oil (vegetable oil) especially if you are red headed or very blond with sensitive skin. sleep, hot flashes, nerves, etc. or you can E-mail us and we will get back to you back as soon as possible. .